Einsteinium (Es) is a radioactive element first found in fallout from a 1952 hydrogen bomb explosion. It was named after Albert Einstein, considered one of the most insightful theoretical physicists of the 20th Century. Born in Ulm, Wurttemberg, Germany, Albert Einstein (b1879, d1955) went to public school in Munich and Aarau, Switzerland. With his father an electrical engineer and Albert occasionally doing various jobs in his father’s factory, it is likely that the new field of electromagnetism was occasionally a topic of discussion among family members. Albert found the topic interesting enough to motivate him to start studies in 1896 in the department for education of mathematics and physics teachers at the Federal Polytechnic Institute in Zurich (from 1911 on called Eidgenössische Technische Hochschule, the Swiss Technical College). There he met and formed a study and eventually romantic relationship with Serb Mileva Marić (b1875, d1948) who was three years older. Often a loner and sometimes plagued by self doubts, Mileva apparently relished forming a close camaraderie with Einstein. 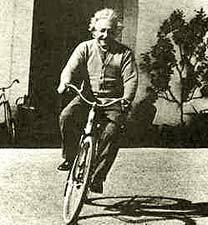 Quick witted, a talented musician, and an accomplished mathematician like Einstein, she was more practical, resolute and serious, while Albert was often impractical, indecisive, but full of humor. She was the only female physics student in his class in an age when professional jobs were reserved for men and consequently few European schools even allowed attendance of women. Mileva and Albert were more interested in reading and discussing the latest physics of Boltzmann, Drude, Helmholtz, Hertz, Kirchkoff and Osward rather than other parts of the required classic curriculum. After sometimes skipped classes of less interest for him, in 1900 Albert achieved an overall average grade of 4.91 (on a 1 to 6 scale, roughly equivalent to 78%) in the final examination, ranking fourth out of the five candidates. Mileva with an average of 4.00 placed last. Diplomas were awarded to the top four, excluding Mileva. Mileva's self esteem was not helped by strong criticism by Heinrich Weber, their professor and department head. With such work reserved for men, only Einstein was granted a teaching diploma from the Polytechnic Institute but received no job; unwilling to meet Weber's demands, Mileva received only a leaving certificate. A year later after repeating the exam but failing again, Mileva gave birth to their daughter, Lieserl, (who may have died within two years or possibly was adopted), cementing disapproval and continuing harsh criticism from Albert's mother. In mid-1902 Albert finally managed to obtain a job as examiner in the Swiss Patent Office in Bern (which he held until 1909). Six months after obtaining employment, they married at City Hall. Mileva gave birth to their first son, Hans Albert, in May 1904. While the examiner job was considered inferior to that of a teacher, it provided significantly more free time which allowed Albert to banter with male friends about apparent paradoxes in physics while Mileva often silently listened attentively. In 1905 Albert Einstein became a Swiss citizen and submitted four epoch-making papers to the German Annals of Physics. The extent of Mileva's contributions to the papers is controversial. They may have continued their earlier practice of studying the latest physics together. Einstein apparently developed with family members when he was young, and continued with other physicists all his life a practice of discussed the latest ideas. 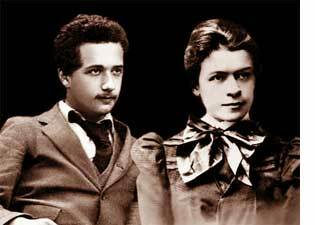 With their shared interests and common training in physics one might surmise Albert and Mileva continued to do so after leaving the Institute. In several letters Albert described his work as a joint venture, a collaborative partnership with Mileva. But European culture strongly discounted inclusion of women in all professional activities. The depth of that expectation might be suggested by her attentive silence when Albert discussed physics with male friends. There remains little direct evidence detailing their collaboration so the controversy will likely continue. The first paper (On a Heuristic Viewpoint Concerning the Production and Transformation of Light, Annalen der Physik 17: 132–148) amplified the concept of quanta proposed in 1900 by Max Planck to explain black body radiation. The paper suggested that light can eject electrons from metals (the photoelectric effect) because that light is a stream of particles which carry bundled energy (quanta) determined by the frequency of the light's waves: E = hν. The theory provided the ground work for the Quantum Theory. Perhaps their interest came via Mileva who in 1897 had audited a semester lectures on heat and electrodynamics by a Professor Philipp Lenard in Heidelberg. Lenard described in a 1900 paper his earlier work on the generation of cathode rays (electrons) by ultraviolet light which Albert read in 1901 with much interest. When earlier in Heidelberg, Mileva had written Einstein describing a lecture by Lenard on the relationship between the velocity of Oxygen molecules and the distance traversed between collisions. After reading Boltzmann's mathematical treatment of gases as point masses, molecular motion was further developed in the second Einstein paper (On the Motion-Required by the Molecular Kinetic Theory of Heat-of Small Particles Suspended in a Stationary Liquid, Annalen der Physik 17: 549–560). This paper mathematically demonstrated that the displacements of random motions of small visible particles (called Brownian motions) could provide verification of the random kinetic motions of atoms. This analysis allowed Jean Perrin to confirm the kinetic molecular theory and the reality of atoms which had been debated for millennia. This provided one of the major reasons the atomic theory has become so widely accepted. The third paper (On the Electrodynamics of Moving Bodies, Annalen der Physik 17: 891–921) considered electrical and magnetic properties of matter viewed from different moving frames of reference, developing the special theory of relativity. Both Albert and Mileva had chosen that topic for investigation while at the Swiss Federal Polytechnic Institute. Unable to distinguish any unique frame of reference, the paper assumes that light must travel at the same speed for all observers. That led to the establishment of the relativity of time. In the fourth paper (Does the Inertia of a Body Depend Upon Its Energy Content?, Annalen der Physik 18: 639–641) Einstein deduced that the equations of special relativity require the equivalence of matter and energy, previously considered distinct concepts. This he expressed with the equation E = mc2. By 1908 Mileva was concerned that the fame and honors those papers generated were changing Einstein and they were losing their previous closeness. When Albert was finally offered a part time job teaching theoretical physics at Zurich University in 1909, they returned to the city where they first met. Mileva gave birth to their second son, Eduard (called Tete), in July 1910. Mileva helped prepare at least some of those lectures but increasingly spent her time rearing the two boys. Albert became more self confident and independent, and no longer wanted to share physics and musical camaraderie with Mileva. 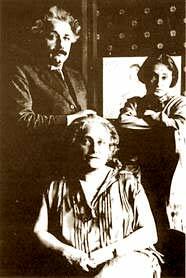 Einstein finally lost romantic interest and in 1912 started an affair with his outgoing, sociable cousin Elsa in Berlin. Einstein spent later life developing an unfinished unified theory of all forces. In 1933 Einstein moved to Princeton, USA, and became a citizen in 1940. Einstein was fond of classical music, played the violin, and championed the underdog. He supported Zionism. But when he was offered the first Presidency of Israel, he declined. He was an ardent pacifist and supported world government. Although not belonging to any orthodox church, he was deeply religious. God's absolute law played a key role in formulating his theories. Allen Esterson voices strong opposition to giving Mileva any credit for any contribution to physics. Perhaps Esterson is a bit unreasonable to demand written documentation for Mileva's contributions when the Einsteins lived in a culture which expected them to refuse to acknowledge or even deny professional accomplishments of women. Other women experiences similar pressure. For example Lise Meitner gave Otto Hahn credit as the senior investigator in the discovery of the chemical element Protactinium when in fact she did all the experimental research and analysis while Hahn was away on the battle front.